I get the impression that I am generally regarded as an “at-large” member of the humanities faculty at the University of Oulu. That’s okay with me, but at some point someone must have asked, where, exactly, are we going to put this guy? I suspect there was no space available either in English—which is, mind you, still a foreign language here—or history. In some ways it might have been most natural for me to make my nest with the geographers. They comprise about three-quarters of the population of my North American City class, except that geography is not a humanities discipline at Oulun yliopisto. The geographers’ digs are over yonder with the real scientists. Anyway, I settled in as gently as I could, and I have tried not to rock the Giellagas kayak. The sign on my door says that I occupy a tutkijanhuone, which means “research room,” I think. My name is on the door as well, so I suppose I should be doing research in here, instead of managing my blog. Academic freedom is grand, init? One day there came a gentle rapping at my door. “Joo,” I said, just as nonchalantly as premeditation will allow. It turned out to be a colleague from down the hall who wanted to know if I would care to borrow a book that he had co-edited and co-written. It's an overview of Sámi culture, written—mainly in English—as part of a celebration linked to the opening of a museum in Inari, a major center of Sámi culture in the far north of Finland. I said sure, why not, thinking that it might help me decide whether to point myself in the direction of the Arctic Circle and Rovaniemi—the Santa Claus city—at the end of the semester, when I will have a few days to kill before heading back to Helsinki for my flight home. As it happens, my office neighbor is a leading authority on Sámi culture. And the book that he lent me—Jukka Pennanen and Klemetti Näkkäläjärvi, Siiddastallan: From Lapp Communities to Modern Sámi Life (Inari: Inari Sámi Institute, Number 5, 2002)—is chock-a-block with fascinating information about the Sámi. 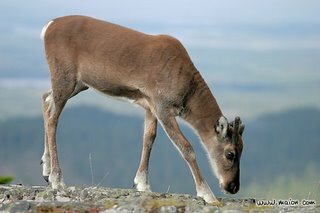 For example, the subject of reindeer herding, interesting in itself, leads in turn to earmarking, which is not just a cultural practice but also—who knew?—a living language. When I say earmarking, I’m not talking about pork legislatively directed to favored constituents. No, I mean the marking of ears. Each Sámi herder has his or her own brand, as it were, which linguists call a “signature.” Though the “alphabet” of knife cuts would seem to be limited, the signatures form very intricate patterns, which are considered the “words” of the earmarking language. Reindeer earmarking is, of course, subject to government regulation. “According to the pertinent statute, “an earmark can cut away up to a third of the ear’s length and a third of its width. Certain cuts, however, cannot be combined on the same ear.” The author of this particular essay, Klemetti Näkkäläjärvi, goes on to say that Sámi herders don’t need the legislation to tell them what combinations of cuts will cause the ear to “fall off, dangle or droop, or be prone to accidental damage.” They know from experience. But I’m sure they think it was nice of the government to codify it for them anyway. The tradition of earmarking—and Sámi culture generally—is endangered, and if I understand the message of this book, what may prove to be the camel’s nose under the tent is the humble snowmobile. And that is why the documentation of earmarking—the practice, and also the language—forms part of the mission of the Giellagas Institute. Exactly how far north of Rovaniemi is Inari? I wonder. I thought y’all might be interested in our Survival Finnish class—a very congenial, if motley, crew. 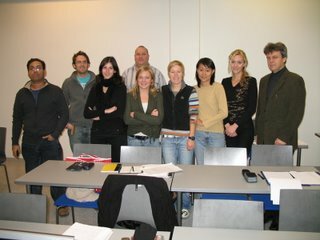 From left to right: Arindam, (India), Lee (England), Brucia (Belgium), Mark (Australia), Krista (Canada), Milla (our vivacious teacher), Inge (China), Alona (Russia), Stanislav (Ukraine).